Hello, I’m Bram Stein, a soft­ware ar­chi­tect and prod­uct man­ager work­ing at Adobe. I care a lot about web ty­pog­ra­phy and I’m hap­pi­est work­ing at the in­ter­sec­tion be­tween de­sign and tech­nol­ogy. Fol­low me on Twit­ter if you like to re­ceive up­dates on web ty­pog­ra­phy, my li­braries, talks, or writ­ing. Feel free to get in touch if you have an idea or a ques­tion – I love col­lab­o­rat­ing and dis­cussing ideas with other peo­ple. I wrote a short in­tro­duc­tion to the CSS font load­ing API for the April 2017 is­sue of Net Mag­a­zine. The ar­ti­cle high­lights the most use­ful parts of the API and how it can be used to load web fonts asyn­chro­nously. 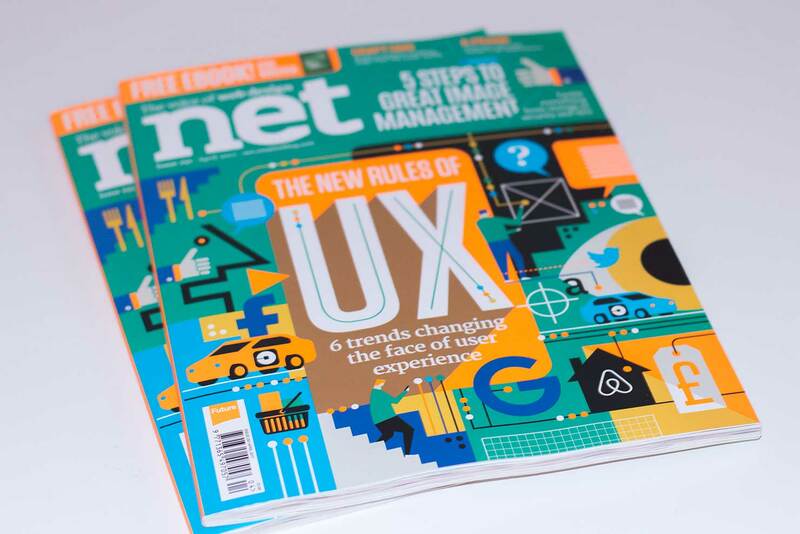 It’s still pos­si­ble to back or­der the April 2017 is­sue of Net Mag­a­zine. 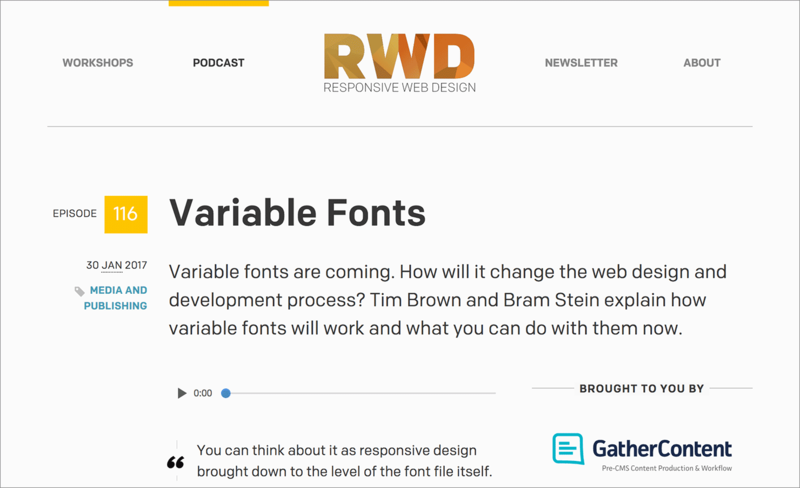 My col­league Tim Brown and I joined Ethan Mar­cotte on the Re­spon­sive Web De­sign pod­cast to talk about vari­able fonts. We talked about what vari­able fonts are, and how they will af­fect re­spon­sive de­sign and web per­for­mance. You can lis­ten to the pod­cast, or read the tran­script. 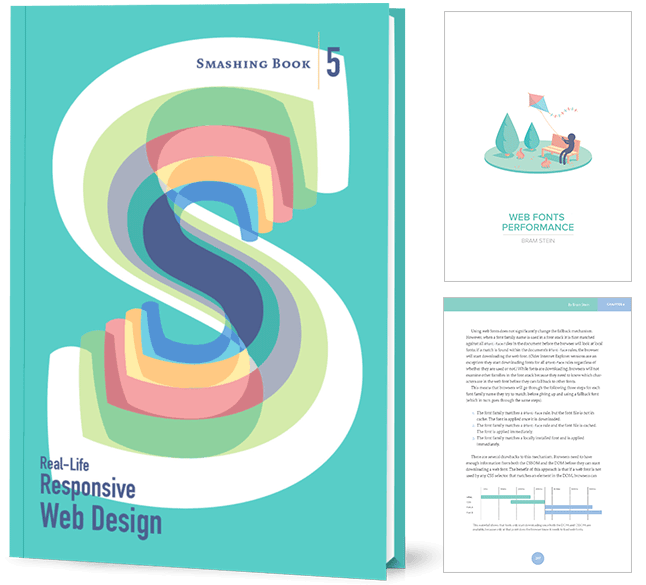 The Web Per­for­mance Cal­en­dar is a re­cur­ring ad­vent cal­en­dar fo­cused on web per­for­mance. I wrote an ar­ti­cle on load­ing web fonts asyn­chro­nously for the 2016 cal­en­dar. The ar­ti­cle con­cisely de­scribes why web font per­for­mance mat­ters, and how to use Font Face Ob­server to get the best pos­si­ble per­for­mance and user ex­pe­ri­ence. 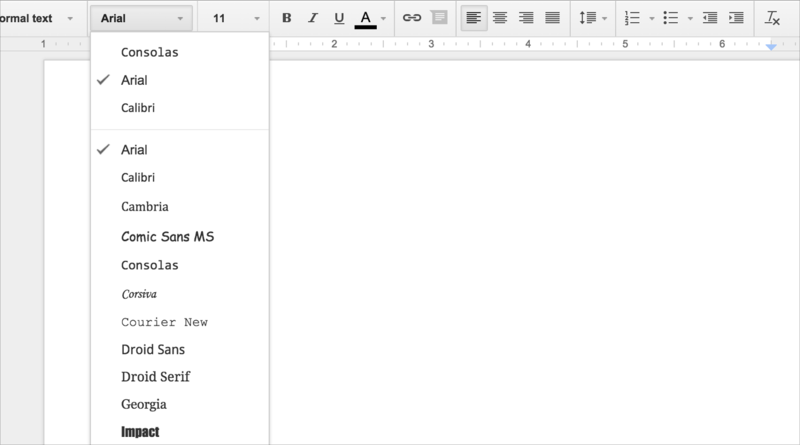 Many web-based text ed­i­tors al­low the user to se­lect cus­tom fonts through a drop down menu. These font menus of­ten in­clude sys­tem fonts. Un­for­tu­nately, there is no web plat­form API for re­triev­ing a list of lo­cally in­stalled fonts. The State of Web Type con­tains up to date browser sup­port data for type and ty­po­graphic fea­tures. 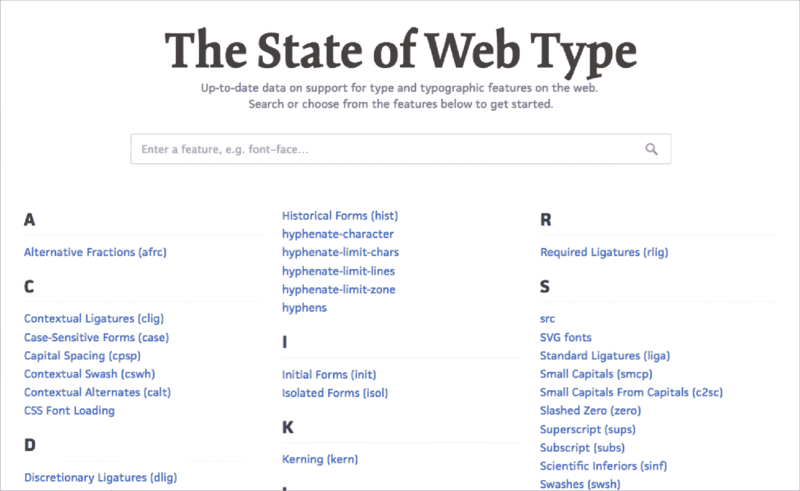 I cre­ated the State of Web Type be­cause no other browser sup­port data site goes into the nec­es­sary de­tail for type and ty­pog­ra­phy fea­tures. The site is fre­quently up­dated with new data and en­tirely open source. Any ad­di­tions, cor­rec­tions, or com­ments are very wel­come.